NaliCity 3 - Map Hub - AS-X-MasNOW! Ho Ho Ho, oh no! Your mission is to secure two bundles of packages, and get them into a not so far away tunnel. Did I mention you have to blow up a gate while being strafed by a M2 50 caliber machine gun. This map reminds me of the intro to the movie "Scrooged" with Bill Murry (c.1988). Enough levity, let me level this map, because out side of its holiday appeal, this map will be in the stack of returned gifts. Ya, and all in 2 minutes!, like you're gonna need all that time just to run to the redeemer! Not to bury this map completely, the extra textures and scenic qualitiys are fairly good. The M2 was a blast, even if it does have its own quirks. 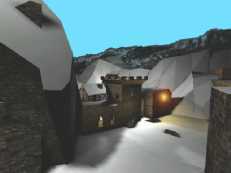 Last, the whole idea of rescuing Christmas is fun, even though over-done by Hollywood it still makes for a unique UT map. Oh, and a custom UMX for the apropriate season's music, just in case you forget what you were doing in the snow. I don't understand this review. uh Twrecks... were you high when you wrote this? It looked good, was rather simple, but I can't remember that last time I laughed so hard. Slinging rockets into the bots to that music just killed me. Sadly, not a keeper, but the music and looks alone earned it a 6. It looks fine and the gameplay is better then you are saying on some points.Playability is better then you are saying. But the problems with this are many. Nothing speciell. The right map for Christmas. The music is quite wierd, and you can't use the cannons, but the textures are still pretty good. the 5 is for the textures alone.